Alumina hydrate promotes opacity in enamels and glazes by generating gas bubbles in the glaze melt. Hydrated alumina (or aluminum hydroxide) contains significant water in its crystal structure. There are differing water contents depending on the type of alumina hydrate, but the main refined article of commerce in the market is known as alpha aluminum trihydroxide or ATH (LOI of about 34%). If you are unsure about the alumina hydrate you have in stock do a simple LOI (Loss on Ignition) test (by firing a sample of powder to 300C and noting the percentage weight loss). Since the decomposition occurs about 220C it poses no threat to creating bubbles in already-melting glazes. That being said, considerable amounts of water are generated and these could affect the density of the glaze lay-down or its adherence to the body or another glaze (or underglaze) layer. 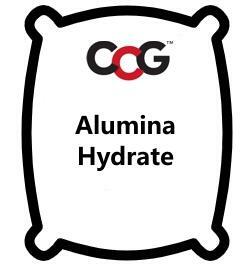 Hydrated aluminas are fine granular white powders that have good flow properties. As with any form of alumina, this material has a very high melting temperature. Notwithstanding this, it disassociates enough in many glaze types to be useful as a source of Al2O3 to the melt (however the finer the particle size the better). The hydrated version of alumina stays in suspension better in glaze slurries and has better adhesive qualities. Also, using hydrated alumina in glazes and glasses can promote a fining operation by coalescing finely dispersed gas bubbles. Small additions of fine alumina hydrate added to a glaze can also enhance the color of Cr-Al pinks. Larger additions of fine material can impart matteness if the glaze is able to take it into solution (sourcing alumina from kaolin, feldspar and frits is obviously more practical since these decompose readily in glaze melts).